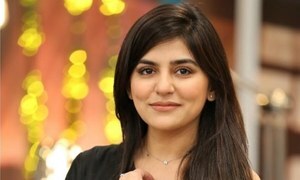 We were all eagerly waiting for upcoming Sanam Baloch-starrer Khaas and finally, the makers have unwrapped its the on-air date. The intriguing play is all set to commence from Wednesday, April 17 on HUM TV. Directed by Danish Nawaz, the play also stars Ali Rehman Khan in a lead role and we are sure Ali & Sanam’s on-screen chemistry will surely lit up our TV screens. The makers have released a few teasers of the play and from the looks of them, Khaas seems to be the story of an intriguing story of a newly married couple but nothing can be said with surety as of yet until we watch the first episode. The play aims to highlight the concept that for a marriage to become successful, respect and equality matter the most. Earlier, Hip connected with Ali Rehman Khan to know more about the drama in general and his character in particular. "I’m playing a very interesting role which will resonate with a lot of married couples of Pakistan. You will definitely see me in a very different avatar and the dynamics between husband and wife are such, that every married couple will be able to connect with my role on various levels," Ali had shared. The drama will bring Sanam back on our TV screens after almost two-year hiatus. She was last seen in 2017’s Teri Raza alongside Sarmad Khoosat. Hence, Khaas is the starlet’s most anticipated come back to play.